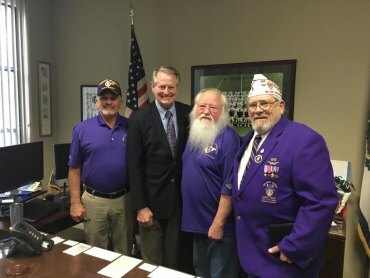 Mayor Steve Williams met Monday, Dec. 19 with members of the Military Order of the Purple Heart today to discuss ways for honoring Purple Heart recipients. An announcement is anticipated in January 2018. City of Huntington Photo: From left to right: Charles Baisden, Military Order of the Purple Heart Department Commander for West Virginia; Mayor Williams; Troy Varner, past Department Commander for West Virginia; and Ed Damron, past Department Commander for Ohio.